Meet your guide in Santa Ana Square, and set off on a tapas crawl of the city, exploring the best bars that only locals really know of. As you stroll, your guide will chat to you about Madrid, the local cuisine and, of course, the tapas bars that no great evening in Madrid should be without! 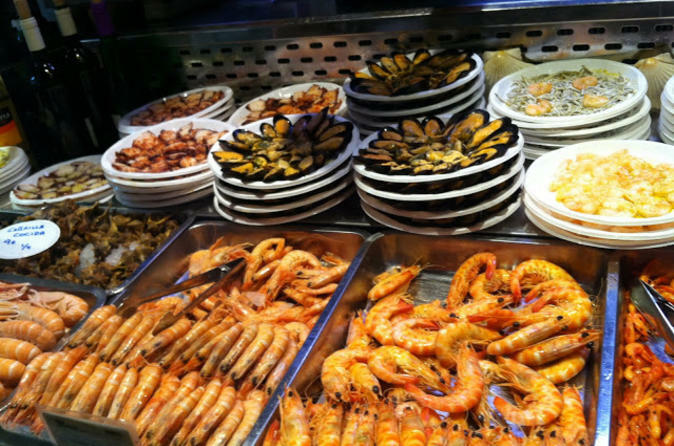 Like all Spanish cities, Madrid has its own regional cuisine with an emphasis on use of local ingredients. Perhaps more so than others, Madrid has been influenced by its immigrant population, who’ve brought in flavors and ideas as cosmopolitan as the city itself. Visit up to four bars on your tour of the town, enjoying wine tastings in each. Sample beautiful Spanish wines made from well-known grapes like tempranillo, malvar, garnacha, and parellada, and enjoy a complimentary tapa (tapas dish) to complement the wine's flavors. Beer and soft drinks (one per bar) are also included should you prefer this to wine! While the dishes vary on each occasion, you can be sure it’s a taste bud tingling treat! Examples of dishes include eggplant with honey, cod brandade, Spanish omelet, Iberian ham and chickpea stew. See the example itinerary for details on the different bars you may visit. Your tapas tour finishes in a centrally located bar so that you’re well-placed to continue your night out independently.